Over Long Island, a blazing streak across the sky marks the return of Nova to Earth! Landing on the front lawn of his parents' house, Nova walks inside and greets his folks. Unfortunately, the auto-translator in Rich Rider's helmet is still on and is set for the Kree language. As a result, Nova begins speaking to his parents in Kree! Realizing that he has scared his parents, the young hero quickly removes his helmet and begins reassuring them in English that he's their son. Later, Rich Rider is having dinner with his family and learns that his brother, Robert, isn't home because he's with his new girlfriend. Nova laughs and enjoys his home-cooked meal until he learns that his folks thought he was dead. Gloria Rider corrects her husband and tells Rich that they only thought that for a few weeks and later assumed he was in space. The Riders' son is confused why they would have thought he was dead at all. Charles Rider tells his son about the events of Civil War which began with the death of the New Warriors at Stamford. Rich is understandably upset by the death of his teammates. Charles, while glad that his son wasn't involved, lectures Nova about his son being a super-hero and how he disapproves of it. Before he can argue, Rich senses that something is wrong outside. Nova puts on his helmet and asks the WorldMind to assess the situation. As he opens the door, Rich Rider finds himself facing a SHIELD strike teams and Iron Man! Ten minutes later, Iron Man and Nova are on the SHIELD helicarrier. Rich firmly tells Tony that he's never to place a strike team on his parents' lawn again. The armored Avenger agrees and apologizes. He explains that SHIELD didn't know what to think when they read Nova's powerful energy signature coming through the atmosphere. The young hero points out that the SHIELD director seems to know a great deal about him. Tony reveals to Rich the details of the Registration Act and how super-heroes are required to to register with SHIELD and that he is the only one with access to the database. However, Iron Man also tells Nova that, during Civil War, the identities of the New Warriors were leaked to the public (by Hindsight Lad). As a result, the media and the public have condemned Nova by his association with the Warriors. Iron Man is curious about Nova's power level and why they're so much higher than his previous power profile indicated. Rich explains how he's the sole survivor of the Nova Corps and that he alone contains all of the Nova Force. The young hero goes on to give Iron Man the details of the Annihilation War and how he killed Annihilus and saved the universe. He then bitterly asks Iron Man what's he's done lately. Tony Stark explains that the Earth has changed while Rich was gone. The public is demanding that heroes be registered, trained and held accountable for their actions. Nova counters that, as a Nova Corps Centurion, he's already trained and disciplined. Iron Man fully agrees and asks Rich Rider to register and join his Initiative Program. Tony explains that by having such a well-trained hero in the program, who is also a former New Warrior, would go a long way towards restoring the public's trust in super-heroes. Rich says that he understands and quotes Spider-Man that "with great power comes great responsibility". Rich Rider is stunned when Tony points out that it was Peter Parker who said it and that Peter is Spider-Man. Rich tells Tony that he'll give him his decision in 24 hours and still can't believe that Peter Parker is Spider-Man. On his way out, Tony suggests that Rich talk to an old friend before he goes. 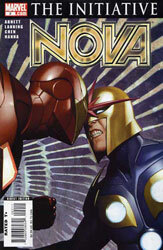 On the helicarrier's landing, Nova discovers his former New Warriors' friend; Justice. Justice and Rich talk about the New Warriors' deaths and how far they've come since the team's beginnings. Vance asks Rich to join Stark's Initiative Program because they could use someone with his power and experience. Rich's friend also advises him to be careful out in public. He reveals that he has received hate mail and the public's wrath even though he hadn't been a New Warriors for some time before the Stamford incident. Vance suggests that Rich not wear his Nova uniform for his own protection. Nova informs that his suit has to stay on for six weeks of quarantine or he risks infecting the Earth with various illnesses he's contracted while in space. Rich says goodbye to Vance and flies off. Later at the Rider house, Rich is troubled as he ponders how things are so different now. The WorldMind advises Rich to get some sleep. He agrees and asks the sentient computer to scan all databases to find out what has happened to all of the remaining New Warriors while he rests. Two hours later, Rich's father comes downstairs to find his son sitting in front of the TV. However when Charles asks him a question, he is stunned to hear the voice of the WorldMind speaking through Rich's body! Realizing that it has scared the elder Rider, the WorldMind tries to talk to him when Rich awakens and regains control of his body. Unfortunately, Charles Rider is beyond reasoning with and screams that he doesn't know what his son is anymore. The next morning, Rich wears a trenchcoat and takes a walk around his old neighborhood. After 45 minutes, the WorldMind is not impressed but points out to Nova that he has been followed since they left the Rider residence. The young hero had already known and turns to confront who he believes to be a SHIELD agent keeping an eye on him. Nova is surprised when the man turns out to be his old foe; Diamondhead! Diamondhead knocks Nova through a number of vehicles and tells him that he's been waiting for his revenge. After the media announced the former New Warrior's return, the super-villain had been waiting at the Riders' house. As Dyker angrily races towards Nova, Rich calmly unleashes a pulse blast and slices Diamondhead's right hand off! After confirmed that no civilians were injured in the altercation, Nova turns his foe over to the authorities. While processing their report, the police ask the young hero for his registration papers. Rich dismisses their request and begins to leave while telling the police that they used to be grateful when he turned in a super-villain. As he leaves the police station, Nova finds himself facing the superhuman police squad called the Thunderbolts!